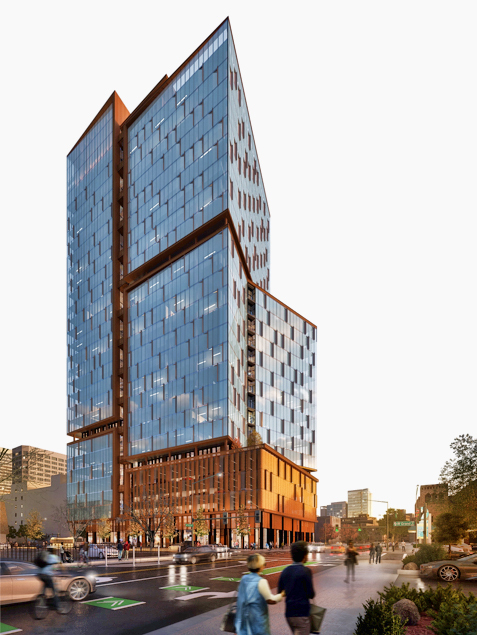 TMG Partners received unanimous approval from the Oakland Planning Commission on their proposed office development at 2201 Valley in Oakland. The development will occupy a full city block between Telegraph Ave, Valley St, West Grand Ave, and 22nd St. The 750k sf office building will include approximately 10k sf of ground floor retail and arts spaces. The project’s large open floors, high ceilings, and column-free spaces – made possible by the engineering required to span the BART tunnel that runs beneath the site – form the kind of creative work space ideal to growing companies. Located only a block from the 19th Street BART Station, 2201 Valley is designed to achieve a LEED Gold designation. The building, designed by Solomon Cordwell Buenz, has proposed fanned vertical steps that embrace the structural requirements of the BART span, and resolve into a visually distinct, stepped vertical tower broken by outdoor terraces and landscaped decks. The building lobby faces towards Broadway and the HIVE along West Grand, and the 10k sf of ground floor spaces include dramatic 30-foot ceiling spaces for local retailers and artists to embrace the Uptown arts and retail community. TMG currently owns and is renovating two other Oakland properties at 1330 and 2201 Broadway.